Oh, China! 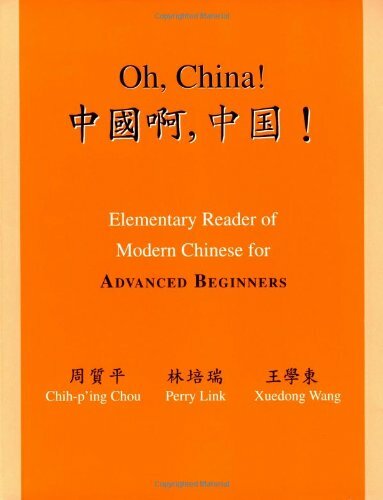 is a textbook for the growing number of "advanced beginners" who are studying Mandarin Chinese. These are students who, usually because of their Chinese family backgrounds, can speak and understand elementary Mandarin, but cannot read or write well enough for an intermediate course. Most first-year texts serve advanced beginners poorly by focusing on elementary vocabulary and conversation that the students already know. In contrast, this book offers help with what they most need: reading and writing, grammar, and achievement of standard pronunciation. The content of the lessons has also been chosen to appeal specifically to advanced beginners. There are three clusters of topics: the home and social life of young Chinese- Americans, the notions of "overseas Chinese" and their ties to China, and important figures in modern Chinese history. Each lesson is given in both traditional and simplified characters, and, for the first fifteen lessons, in hanyu pinyin as well. The lessons are accompanied by vocabulary lists, grammar notes, usage exercises, and character stroke-order charts. The book begins with a detailed chapter on "foundation work" in Mandarin pronunciation, complete with exercises. It concludes with a complete Chinese-to-English vocabulary index. Oh, China! is designed for one year's study at the college level and will prepare students to enter third-year courses. The latest in a series of Chinese language texts published by Princeton University Press, it will meet an important and growing need in the teaching and study of Mandarin. Audio and video materials are available for use with this text. For further information, contact the Chinese Linguistics Project, 231 Palmer Hall, Princeton University, Princeton, N.J. 08544. (609-258-4269). Chih-p'ing Chou and Perry Link are Professors of East Asian Studies, and Xuedong Wang is Lecturer in East Asian Studies, at Princeton University. All have contributed to earlier volumes in the series of Chinese-language textbooks produced by the Princeton University Chinese Linguistics Project for Princeton University Press.